As Jamie Lloyd takes a break from his season at the Traflgar Studios, a revival production of Henrik Ibsen’s Ghosts takes the reins over winter. Hot off the back of a successful run at the Almeida Theatre, Richard Eyre’s production of Ghosts opens at the studios in December, with leading cast members Lesley Manville, Jack Lowden, Brian McCardie and Charlene Mckenna reprising their roles. Ghosts tells the tale of Helen Alving, a lady who hides the evils of her marriage by channelling her energies into building an orphanage in her dead husband’s name. It is revealed that the late Captain Alving was a persistent philanderer however his wife could never find the courage to leave him for fear of being spurned by society. Helen hopes the orphanage will be a valid distraction as well as a vehicle to diminish the Captain’s wealth so that their son, Oswald, does not inherit anything from his father. However it is revealed that Oswald has already inherited more than enough from his scoundrel parent… To make matters worse he appears to be in love with his dads illegitimate love child, aka his own sister. The play concludes with Oswald begging to be killed, leaving Helen to decide whether she wishes to end his life. 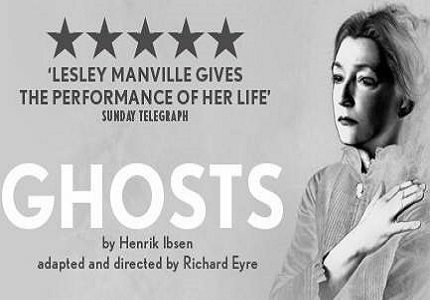 In classic Ibsen style, Ghosts isn’t exactly sunshine and lollipops, however it is a cutting examination of 19th century principals and a typical examination of women’s oppression. Ghosts is an adult play with adult content, including references to euthanasia and syphilis. This show is not recommended for children.